Success in the fashion industry requires more than just designing and manufacturing quality apparel and accessories. Fashion marketing connects products with customers and is critical to the business of fashion. A specific aspect of fashion marketing, visual merchandising, centers around the placement and presentation of products, often in retail stores. Mannequins, window installations, and wall displays are all examples of ways visual merchandising is used to get a customer’s attention and guide their purchase decisions. If you’ve ever walked past or inside a retail store, then you have seen visual merchandising at work. So what is visual studies? While a person in visual studies may wear multiple hats, the general definition of visual merchandising is a marketing technique that employs the use of floor plans and three-dimensional displays to entice customers, project a positive store image, and maximize sales. Visual merchandising begins on the outside of the store, often with attractive window displays, to entice the customer to come inside. Visual merchandising in the store, including interactive displays or seasonal decor, can be used to set a mood and introduce customers to new or featured products. The visual merchandiser will also consider in-store traffic flow patterns to identify the optimal placement of displays and new products. As visual merchandiser in fashion oversees and coordinates the display exhibits and decor in a retail store. This begins by deciding on a theme for the store and then evoking that concept visually through design techniques. A visual merchandiser may choose a color theme, tell a story, present a lifestyle, or evoke a particular emotion. Corporate messaging and product branding will also be taken into account. The visual merchandiser will then execute their strategy, relying on their knowledge of fashion marketing and design theory. The best way to start on the path to a career in this field is by earning a degree in visual studies, a degree in visual merchandising, or a related field. Employers will expect applicants to have experience in design theory and be savvy in retail business practices. A degree in visual studies or a degree in visual merchandising will equip you with the skills required for success on the job. In a visual studies or a visual merchandising program you’ll learn a range of skills specific to this profession, such as designing store layouts, conducting market research, and budgeting display creation, readying you for becoming a visual merchandiser. Employers may hire a visual merchandiser without this education, but a visual studies or a visual merchandising degree means you have the most directly-applicable preparation for being a successful visual merchandiser. Additionally, all courses at LIM College mix coursework with hands-on experience in a variety of settings which is very attractive to potential employers. Who is a Good Fit for Becoming a Visual Merchandiser? Visual merchandising calls for someone who is creative and hands-on. If you’re innovative, design-oriented, and thrilled at the possibility of making a store look amazing, visual merchandising might be right for you. This is an attractive career to many because it unites an eye for design and style with business strategy. In addition to being creative and business-minded, visual merchandisers and visual merchandising managers must also stay aware of current fashion trends and customer preferences. A love for fashion is only the beginning. Learn about the 5 practical things you should know about having a successful career in the fashion industry. Take the first step and download the free guide. Interested in starting your journey to becoming a visual merchandiser? LIM College offers a specialized Visual Studies degree program that will give you a competitive edge in the professional world. In LIM College's Bachelor of Business Administration (BBA) degree program in Visual Studies you will develop creative and technological skills, while also taking core business courses. Whether in a computer lab, photography studio, or in an actual professional workplace, your learning will be focused on skills and knowledge that can be applied in a variety of creative careers across a broad range of industries, including traditional retail visual merchandising, exhibition design/installation, and set design/photo styling. Contact LIM Admissions for more info or learn more about Life at LIM. 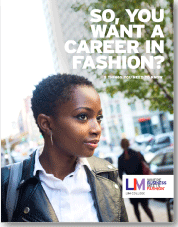 Continue to explore this industry and learn more about your career in the business of fashion.